PALM DESERT, CA -- It's strange how you'll find beauty in unusual places. Like when a volcano erupts, the entire landscape turns charred and gray -- but nature soon pokes up through the ash, and it's amazingly beautiful. Similarly, you'd probably never think of a desert as a place to find some of nature's wonders, but again you'd be wrong. Deserts may be full of sand, cacti, snakes and scrub -- but if you look hard enough, there'll be some flowers out there, too. Finding beauty in odd places is exactly what they've done in Palm Desert, California in creating the Desert Willow golf complex. 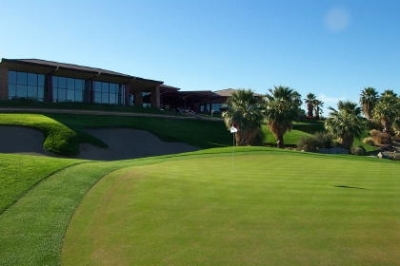 The idea was to blend golf courses amongst the natural desert environment, all the while garnering color through the planting of native desert flora. Somewhat surprisingly, it works. 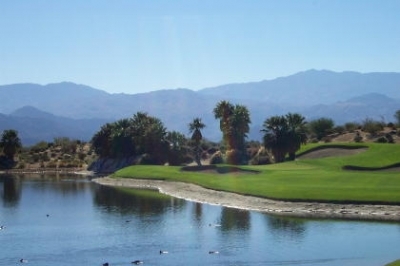 It's not surprising in the golf sense -- there are lots of terrific golf courses in the Coachella Valley; but it was surprising that the natural desert could be so beautiful. Rodney Young, Desert Willow's General Manager, says it's the attention to the environment that sets his resort apart from the others: "There are some private courses farther up the canyon that also emphasize the desert plants, but there isn't a course in the surrounding area that's done it to the extent we have. We're probably the only golf course ever featured on the cover of Smithsonian magazine -- because preserving the natural desert environment was always our first priority. The plan was to weave golf into a natural desert, minimizing water usage, planting thousands of native desert flowers and bushes that really foster the beauty of the area." Young continues, "But it's more than a desert arboretum. We've created habitat for native desert animals, too -- and they've come back in great numbers. There are bobcats, coyotes, rabbits, squirrels, just about everything you'd expect to find living in the desert." Wonder if that includes rattlesnakes? Another unique characteristic to Desert Willow is its ownership. 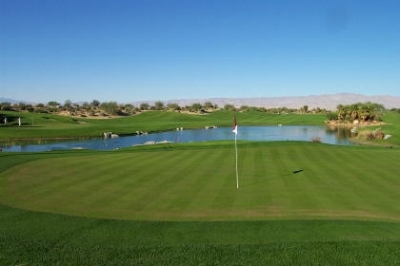 The complex is run by Kemper Sports Management but owned by the City of Palm Desert -- so technically this is a 'muni' course, where residents play for $45 year-round. I've seen some good bargains, but this one ranks up there with the best of 'em. Even the fees for non-residents are certainly competitive with the balance of the desert courses in the Coachella Valley. The name also has a story. The 'desert willow' is one of the few trees that is native to the desert environment, so it fits perfectly with the theme of the property. 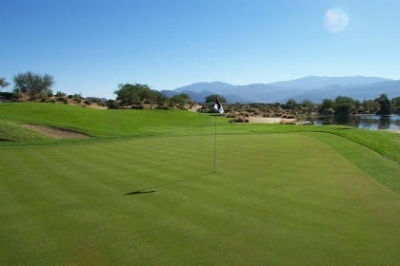 We played the Firecliff course, which happens to be a combination of the names of two founding citizens of Palm Desert. 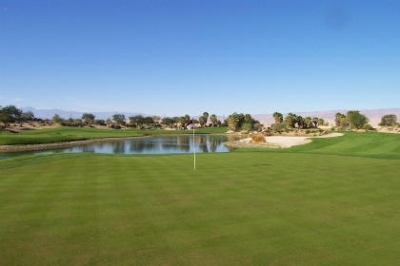 Desert Willow's two courses (Mountain View is the second layout) were designed by Michael Hurdzan and Dana Fry, with consultation by former Palm Desert resident and active PGA touring pro John Cook added in. They've combined to create a challenging layout that emphasizes not only the desert foliage, but also the mountains in the distance. As Young explains, a lot of the challenge comes from the architects' use of sand to shape the holes. "For most people, if it's their first time here, they tend to focus on the sand. You stand on the first tee of the Firecliff course, and of course there's a lot of sand in view -- but you've got to try and focus on the green grass. There's probably about ten times as much grass as there are bunkers or desert waste areas, but those things tend to draw you in." That's very true. As you travel through the course, you'll notice a plethora of hazards cleverly placed to make the course 'look' more difficult than it is. 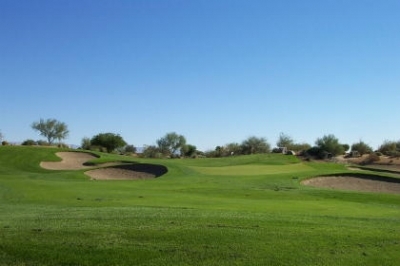 Don't get me wrong, the Firecliff course is one of the more difficult layouts in the desert -- stretching to 7056 yards and a slope of 138 -- but it looks even tougher than it plays. As is true for many modern designs, once you reach the landing areas, you'll notice there was plenty of room there all along. In addition, Young says there's always a bail out area if you don't want to hazard the more difficult shots: "I think the design works so that there's always an option for higher handicappers to shoot away from the trouble. For example, if there're bunkers on both sides, it may be a 100 yard carry to reach the bunker on the right -- but a 150 yard carry to lay up short of the bunker on the left. And it's not like it's so tight you can't see it in the visual sense." Again, that's true, but I found taking a yardage book along on the course helps out greatly -- it even supplements the cart's GPS system. "You'll hit every golf club in your bag out there. Most holes offer bump and run shots to roll the ball on the green, and there are no forced carries from the forward sets of tees. In other words, there's nothing tricked up there. It's not like you hit to the green and all of a sudden there's a bunker there," Young adds. For the better players from the back sets of tees, there are also the risk-reward opportunities you'd expect from a design of this quality. Water comes into play on five holes, and you'll challenge large bunkers, waste areas and a few reasonable carries. Desert courses are mostly target layouts, and this one certainly has its target elements. Approaching the green of the 569 yard, par five 7th hole, you'll see a narrow passage for a bump-and-run, but it's better to fly it there. 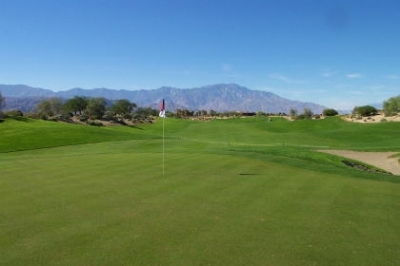 A final note before I describe some of the holes is Desert Willow's service. As I've come to expect from a course managed by Kemper Sports, it's outstanding. The staff is friendly, of course, but you'll also receive unlimited range balls, access to a large putting green, chipping areas and practice bunkers. And there isn't a loud speaker blaring in your ears, either -- you're called by an Outback Steakhouse-like 'buzzer' that'll tell you when to report to the starter. Well done, all-around. As Young alluded to earlier, the view from the first tee sets the tone. From the back tees, you're called to fly a waste bunker short, carry bunkers to the left and stop short of bunkers to the right. The playing surfaces' edges are elevated, so if you miss the fairway, you'll not only have to deal with the thick rough -- but also likely a tricky lie. More bunkers wait short of the second shot landing area, and a huge bunker lies short and left of the green. Quite a wake-up call for a morning tee time. 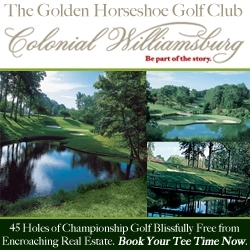 Number four's the #1 handicap hole, and if you're not warmed up by now, it could be a long trip to the green. You'll have to carry desert flora and a waste bunker to reach the greenery -- but it's only a hundred and twenty yards or so. The waste bunker evolves into a huge waste area that hugs the entire right side of the hole, all the way to the green. If you get in that thing, do the smart thing and aim diagonally left -- or face the potential of being in there for several shots. A beach bunker guards the right side of the par three 17th. Six is a great hole. Risk-reward all the way, you can pull out driver and try and get as close as possible to the green (331 yards from the tips), or lay-up with an iron and leave a wedge into the green. There's a large lake to the right and bunkers squeeze the distant landing area to the left. You could make three or six here very easily. Nine's a good one to finish up the front. Long and difficult (455 yards), the landing area's wide, but framed by bunkers right and left. A lake that the hole shares with the eighteenth lies to the left side of the second shot landing area -- but there is room to bail short and right. This may be a good hole to think about a pitch and a putt for par if your tee ball isn't long and well located. The back nine's not quite as secluded as the front, as there are houses and condos lining a few of the holes -- but there's still a healthy dose of beautiful desert flowers to attract your gaze. Fourteen's probably the most visually memorable hole on the course -- a 176 yard par three. There's water to the short left, and the green lies at the bottom of a scrub covered amphitheater. There's another large bunker between the slope and the green to the left (also one to the right), so anywhere but the green's not an attractive option. Sixteen begins a spectacular closing sequence. The green on this hole is at the base of large mounds that invite a gaze towards the high mountain peaks in the distance. There's sand to the left and the second shot's elevated, so par's a good score. Seventeen shares a lake with the par three eighth hole, but features a large beach bunker alongside the water to the right. It's also the longest par three on the course at 204 yards, so stay off the beach and out of the water -- plenty of room to bail left and short. Eighteen's a great risk-reward par five to close out the round. Your tee ball must avoid a bunker to the right and palm trees and a stream to the left -- to set up a potential shot at the green in two. If your drive finds trouble, there's a rock filled stream that'll play havoc with your second shot. If you choose to go for the green on your second, there's water all down the right and plenty of sand to the left. The Desert Willow Clubhouse overlooks Firecliff's 18th green. Not a bad place to take in an afternoon meal, and enjoy the air conditioning. When you finish your round, I'd recommend visiting Desert Willow's excellent clubhouse for an afternoon repast, taking in the views of the golf course and the beautiful desert environment. If you do, you'll certainly realize that beauty's not just in the eyes of the beholder -- it's often found in desert places, too. High Season rates -- $135-$165. Summertime -- $65-$75. Twilight and Super Twilight Rates: $65-$95. Palm Desert Residents: $45, year-round. Rates include carts with GPS and range privileges. Large natural grass range with putting green and short game practice area.